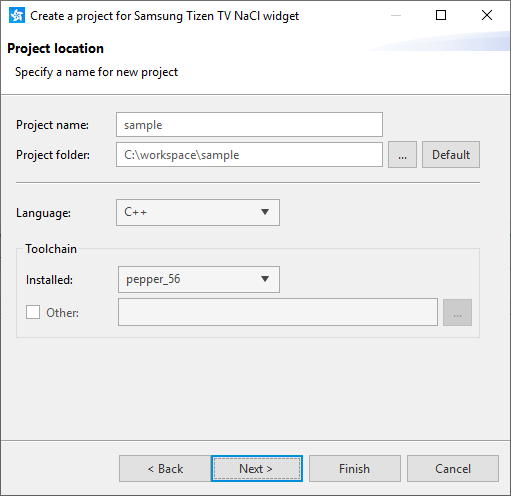 This topic describes how to configure the Tizen Studio for working with the NaCl (Native Client) SDK, and how to create a Native Client project. 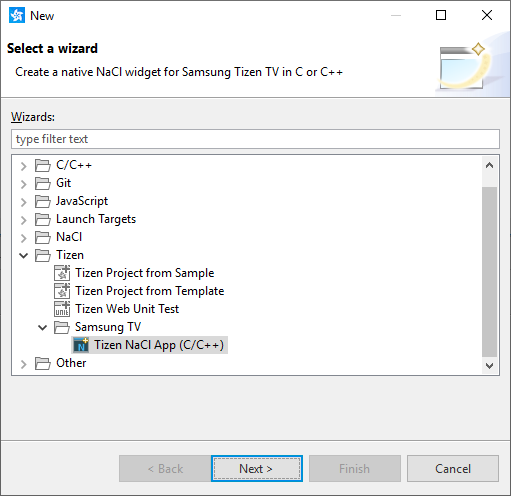 To create Native Client (NaCl) applications for Samsung TVs, you must use the Tizen Studio with the Samsung NaCl SDK. The Samsung NaCl SDK provides additional TV-specific interfaces beyond those supported by the Google Chrome™ NaCl SDK. Install Python 2.7 or higher on your computer. Make sure that the "python" executable is accessible from your PATH environment variable. Python 3 and higher is not supported. Install the Samsung TV SDK, which includes the Tizen Studio and the extensions needed to develop TV applications. Install the Samsung NaCl SDK version you want to use. 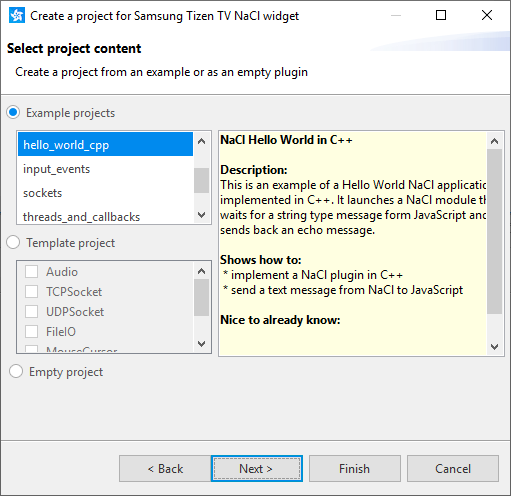 Since Samsung TV Extensions 5.0, download and install the Samsung NaCl SDK using the NaCl SDK Manager. Download the Samsung NaCl SDK to your computer and extract the "nacl_sdk" folder to a location of your choice. Open the NaCl SDK Manager. In the Tizen Studio, select "Window > Preferences > Tizen Studio > NaCl". Enter the full path to your "nacl_sdk" folder in the "NaCl SDK root" field, or click "Browse" to open the file browser and select the folder. Do not select the "pepper_xx" folder within the "nacl_sdk" folder. If you have worked with the NaCl SDK before, the Tizen Studio automatically detects the path specified by your NACL_SDK_ROOT environment variable. 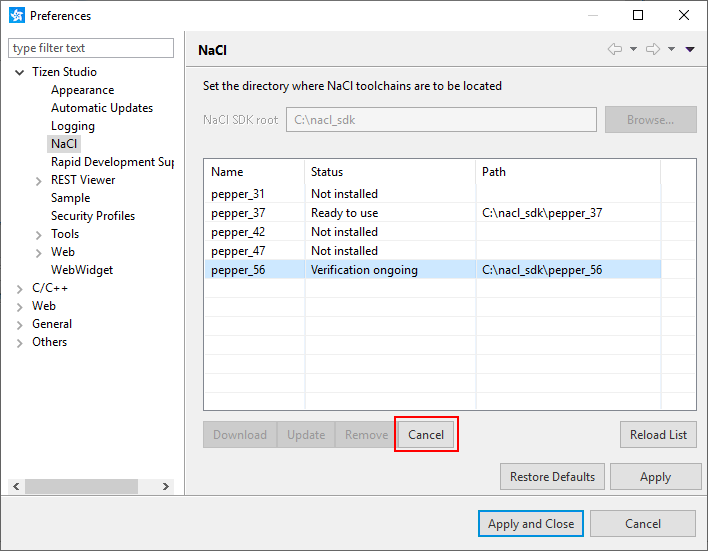 If any NaCl toolchain is unavailable because of background tasks, such as verification, the "Browse" button is disabled and it is not possible to modify the NaCl SDK path. To cancel a background task, select the affected toolchain and click "Cancel" below the toolchain list. In the Tizen Studio, select "File > New > Other". Select "Tizen > Samsung TV > Tizen NaCl App (C/C++)", and click "Next". Define the project name, project folder, and programming language. Select the NaCl toolchain ("pepper_xx") that you want to use, and click "Next". Select whether to create an example project or an empty project, and click "Next". The example projects introduce how to implement various basic NaCl features. For more information, see Sample-based Tutorials. The template project includes code stubs for the interfaces you select from the list. The empty project is a basic NaCl module that does not provide any functionality. It contains only code stubs for the important functions that must be implemented. Define the position and size for displaying the NaCl module on the Web page, and click "Finish". If you selected an example project, the position and size controls are disabled.